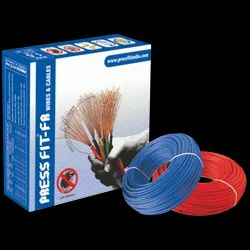 Press Fit - India's Leading Brand of Electrical Products - offers fire-retardent ISI-Marked House Wires that are superior in quality and affordable in price. House Wires provided by us are available for both high & low voltage electrical installations assuring uninterrupted power supply. They are highly appreciated for having fire-resistant top insulation in order to prevent any hazard due to short circuit. Two Core Cable has been specifically made having two separately insulated copper wires that are enclosed in another single plastic cover. It is widely utilized for various electrical connections in multinational companies, offices, houses, and shops. This cable is known to assure no electrical loss and uninterrupted supply of power even during voltage fluctuations. It comprises a live & a neutral wire and is also suitable to be used for electrical appliances. Three Core Submersible Cable offered by us is made of superior quality which provides high-grade insulation. It is highly appreciated for being water & fire resistant in nature assuring its safe use with water pumps & motors. This cable has double thermoplastic insulation with good structural flexibility which allows it to be installed in compact spaces. It has the great current carrying capacity with the ability to resist damage caused due to frequent voltage fluctuations.